In connection to data handling, decree 196/2003 guarantees their protection against persons and other parties. Hotel Villa Undulna, Terme della versilia handling and holding your personal data inform that: the information you provide ( personal, account, fiscal data) is used to fulfil all obligations deriving from commercial contracts, to manage your account, administrative and fiscal issues and our business relation. At this purpose data processing is carried out through computer and data transmission systems in the respect of your rights and privacy. The security measures taken by Hotel Villa Undulna, Terme della versilia ensure the access to your data only to authorized persons and avoid spreading your personal details. It is necessary that you convey us your personal data to satisfy the aims described above and all law and contract obligations. Hotel Villa Undulna, Terme della versilia located in Viale Marina, 191, 54038 Cinquale di Montignoso (MS) complying with decree 196/2003 is entitled to hold your data. In compliance with Art. 7 of decree 196/2003 you could always assert your rights against the party entitled to hold your data. Nur 50 Meter vom Strand der berühmten Versiliaküste der Toskana entfernt, befinden sich das Hotel Villa Undulna und seine Thermen in der Ortschaft Cinquale di Montignoso. 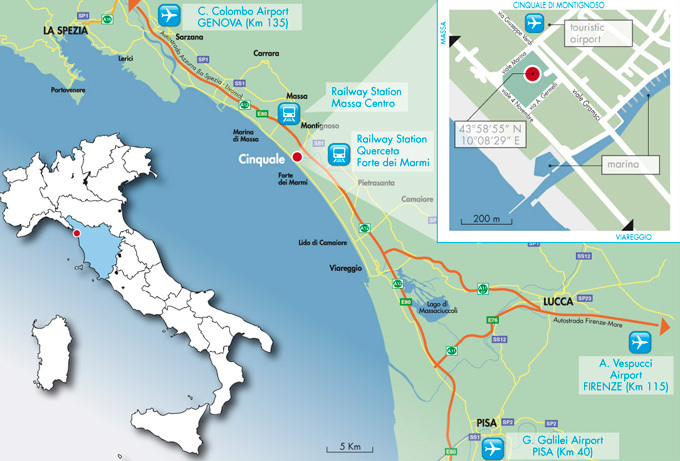 Das Zentrum des rennomierten Ferienortes Forte dei Marmi liegt nur 3 km auf der Strandpromenade entfernt, während der Zivilflugplatz 150 m und der kleine Hafen 200 m entfernt liegen. Autobahn A12 Ausfahrt Massa – bis zur Strandpromenade fahren und dann Richtung Forte dei Marmi Viareggio fortfahren. Autobahn A12 Ausfahrt Versilia – in Richtung des Zentrums von Forte dei Marmi fahren und bei der Strandpromenade angekommen in Richtung Massa fortfahren. Der Flughafen von Pisa (G. Galilei) liegt ca. 40 Autominuten entfernt (Autobahn A12). Der Flughafen von Florenz (A. Vespucci) liegt ca. 60 Autominuten entfernt (Autobahn A11).